Children are infamous for being finicky eaters. But for mothers like Lee Li Ming, who writes about kid-friendly recipes at Bentomonsters.com, a dose of creativity comes in handy when enticing children to eat healthy food that they usually find unappealing. A good technique is to “hide the food they don’t like in food they like to eat”. For example, if your child hates vegetables but likes meat, you can mix vegetables into meatballs and they will be willing to eat them. 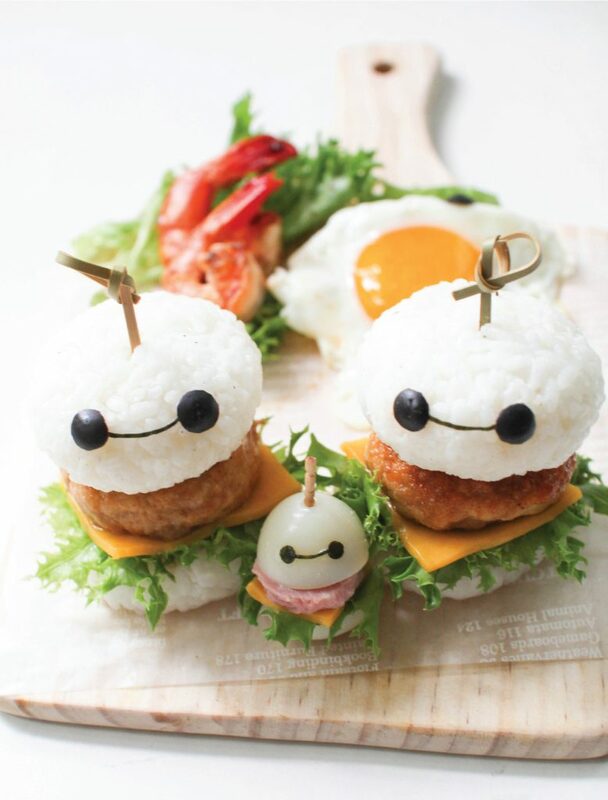 Through colourful presentations in the forms of cute film characters or superheroes (such as Baymax, see recipe below), children are easily intrigued and will be encouraged to try the food before them. “It does slowly help them to eat the food they dislike,” says Ming. Scoop around 150g of rice onto cling wrap. Bring the ends of the cling wrap together. Twist the ends to tighten as you shape the rice into a compact rice ball or use your hands to mould the rice into a dome shape. Repeat for the other 150g of rice. Slice an olive into half for Baymax’s eyes. Attach this onto the rice using pasta sticks. The moisture in the rice will soften the pasta and they will be safe to eat after sometime. If you are eating them immediately, fry the pasta stick in a little oil till they turn brown and use this instead. Using a pair of scissors, cut out a curved line from the seaweed for Baymax’s mouth and place it onto the rice. Mix chicken, egg, salt, ginger, and spring onion with all marinade ingredients. Drain tofu for 15 minutes. Pat tofu dry on kitchen towel. Crumble tofu and mix with the mixture in step 1. Shape into patties. Heat some oil in pan. Cook patties for around 5 minutes on one side, or until they are brown. Flip over and continue cooking for another 10 minutes on medium low heat. Remove and set aside. Pour all ingredients for the sauce into a pan and bring to a boil. Add chicken patties to the pan and coat well in sauce.